This section reviews current technologies and best practices that, when used, lessen the negative impacts of large-scale livestock production for workers, neighbors, animals, and the environment. Expansion of these programs and their use in conjunction with new waste management technologies benefits the livestock sector and protects rural communities. 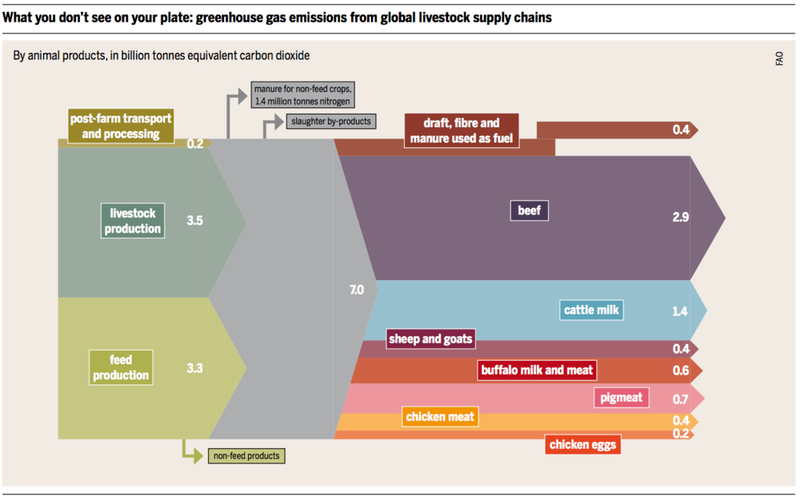 The graphics below document the emissions from livestock production, which negatively impacts ambient air quality in the surrounding area and can contribute to odors. Odors which are commonplace in a small-scale diversified livestock operation are substantially multiplied at CAFOs, due to the sheer number of animals and volume of animal waste contained on site, and can become a nuisance for neighbors. Some interventions have been adopted to deal with the air pollution and odor caused by current animal waste management practices. Wet scrubbers are used on ventilation air as it exits livestock housing. They use liquid to collect dust or particulate matter (PM) and absorb gases from air by using a wet surface, spray system, or wet material bed. Some scrubbers use water, which is then partially recirculated, while others use an acid or base to shift the pH for absorption of specific gases in the air. The liquid effluent is then treated as a waste product. Poultry scrubber operations were found to be more efficient in ammonia recovery than similar scrubbers in swine facilities. Preliminary economic analysis showed that scrubbers for a swine finishing facility and a poultry manure composting facility would need one year and five years of continuous operation, respectively, to break even with total fixed costs and operational and maintenance costs. The use of biogas or methane digesters with CAFOs not only serves as a source of energy for the farm, thereby decreasing the amount of fossil fuels consumed to run day-to-day operations, but also allows a reduction in methane, CH4, and nitrous oxide, N2O, and a decrease in the use of synthetic fertilizers (Hermansen et al., 2011). When manure is stored in a digester, it is covered with a tarp, which prevents much of the odor from escaping into the air. CAFOs are classified as a "point-source" for water pollution under the Clean Water Act. CAFOs and their waste management systems store massive volumes of manure in fairly small areas. The combination of extreme rainfall events and the application of manure on agricultural fields poses significant risks of ground and surface water pollution. 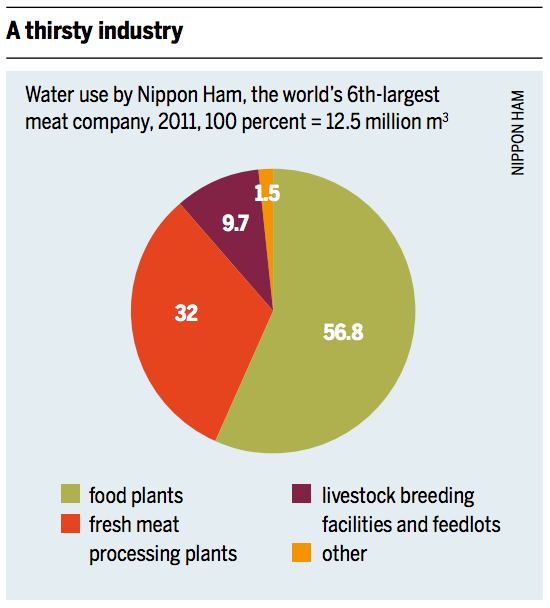 Small changes in drinking bowls and feeders used on farms can lead to significant decreases in water consumption. This can dramatically reduce utility costs for the operation of the farm. The graphic below shows that the USA could be more efficient in its water use relative to other countries. Ambient air temperature also influences water consumption of hogs; every 1 degree Celsius of temperature rise above 20 degrees Celsius will lead to 0.2 liters more water consumption per hog. Thus, improvements in barn cooling and ventilation can yield water savings. A vegetative filter is simply a grassy area that receives rainfall runoff from an open livestock feedlot. The vegetative filter separates nutrients from the lot runoff and provides an infiltration area for the runoff water so that no discharge into the environment occurs. In a digester, waste falls through slats on the CAFO floor and is then flushed into the digester where it is decomposed for three weeks. This process is similar to the open lagoon method, except digesters are covered and they produce methane that can be stored and used as energy. An SBR is a wastewater treatment process. SBR reactors treat wastewater such as sewage or output from anaerobic digesters or mechanical biological treatment facilities in batches. Based on equipment costs between $94,000-1,170,000 depending on the designed flow rate which can range from 0.012-4.25, the cost per gallon of water treated is on average $2. Oxygen is bubbled through the mixture of wastewater and activated sludge to reduce the organic matter, measured as biochemical oxygen demand (BOD). The BOD and nutrient removal efficiency is between 85-95%. The SBR system is beneficial because all the steps to cleaning the water are contained within the one tank. In addition, it has the ability to work in many different operating conditions so it opens up the possibility for differing levels of treatment if needed. Finally, the system leaves a very small environmental footprint. CAFO employees are exposed to high levels of dust, gases, and particulate matter in the confinement barns, which can cause a number of eye, nose, throat, and upper respiratory ailments without the right protective gear. Face masks are an important step in protecting the respiratory health of farm workers who directly interact with the animals. More advanced methods of protection includes face masks coupled with respirators, ear plugs or noise-cancelling ear muffs, coveralls, boots or shoe covers, gloves, goggles, or head and hair covers. Protection may include disposable National Institute for Occupational Safety and Health (NIOSH)-certified filtering facepiece respirators. Shower-in/shower-out procedures are also strongly recommended for CAFO employees. Workers should wash hands thoroughly for 20 seconds with soap and water after removal of any personal protective equipment (such as the respirators described above) and/or contact with infected animals or possibly contaminated surfaces. These practices help to reduce and prevent the spread of antimicrobial resistant bacterial strains.